AllegroMedical.com presents The Roho Nexus Spirit Cushion. 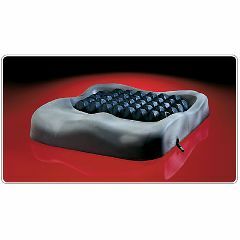 The ROHO® nexus SPIRIT® Cushion (nexus SPIRIT) is a wheelchair support surface with a contoured foam base, combined with a ROHO DRY FLOATATION® air-filled, adjustable, cellular design insert, designed to conform to an individual’s seated shape in the pelvic loading area. The nexus SPIRIT is recommended for individuals of any weight* who may require skin/soft tissue protection and/or positioning while seated. The nexus SPIRIT Cushion must be used with the supplied cover. ROHO, Inc. recommends that a clinician such as a doctor or therapist experienced in seating and positioning be consulted to determine if the nexus SPIRIT cushion is appropriate for the individual's particular seating needs. If you are using a wheelchair with a sling seat, ROHO, Inc. recommends the use of the ROHO Contour Base, the ROHO Planar Solid Seat Insert, or a solid seat platform in conjunction with your wheelchair cushion for best positioning results. Cushion must be properly sized to individual.